River Downs is a horse racetrack located in Cincinnati, Ohio. River Downs opened in Cincinnati, Ohio in 1925. It was opened 15 years after the closing of a previous track in Cincinnati, Old Oakley Race Course. The race track sits right along the banks of the Ohio River. The track was originally named Coney Island and is adjacemt to Coney Island Amusement Park. The famous horse Seabiscuit made two appearances at River Downs in 1936. His trainer “Silent Tom” Smith shipped the horse in from Detroit with jockey “Red” Pollard for two consecutive starts. On October 3, 1936, he ran third in the Western Hills Handicap and two weeks later he ran third in the Eastern Hills Handicap. The track managed to survive the disastrous Cincinnati flood of 1937 and re-opened under the name of "River Downs." Races were and still are held primarily in summer. The 7-furlong turf course was created in 1956, making River Downs the 13th track in America with a grass racing strip. The infield grass course has drawn rave reviews from horsemen across the country. Hall of Fame jockey Laffit Pincay, Jr. once quoted, "This is the best turf course I've ever ridden on," after he rode Highland Crystal to victory in the Budweiser Breeders' Cup there. On May 17, 1976 an apprentice jockey won the eighth race at River Downs aboard Red Pipe. It was the race that would launch the career of one of the world's most renowned riders, . "The Kid", as he was called, went on to be the leading apprentice and overall rider at River Downs that season. He later rode Affirmed to become the youngest rider to sweep the Triple Crown. He eventually became a champion rider in Europe and may forever be the only jockey ever to win the Irish Derby, French Derby, English Derby and Italian Derby in addition to capturing America's "Run for the Roses." During the 1980s, the Miller Genuine Draft Cradle Stakes grew to become the richest race for 2-year-olds in the state of Ohio. The 1983 winner, Coax Me Chad, went on to a second-place finish behind Swale in the Kentucky Derby the following year. The 1984 "Cradle" winner did his predecessor one better – he won the Kentucky Derby. Spend A Buck not only won the Derby, but went on to win ten races and over $4.2 million, eventually being crowned Horse of the Year. In 2009 it became the Bud Select Cradle Stakes ($200,000 USD purse) continues to be the major stakes race that River Downs hosts and is complimented by the $100,000 Coca-Cola Bassinet Stakes for filles. The Bassinet is the richest race in Ohio for 2-year-old fillies and has produced many outstanding runners including the Eclipse Award winner Carressing. Over the decades, the wooden grandstand began to strain. 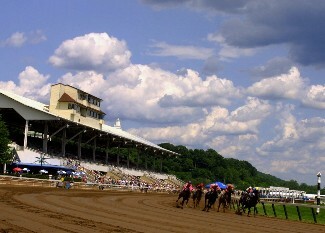 The current track owners and managers, who purchased the facility in 1975, elected to construct an entirely new grandstand, beginning immediately at the end of the 1988 racing season. Management kept the style of the traditional open-air grandstand. Wooden benches were replaced with well-spaced stadium seats, a game room was installed next to a new gift shop, and escalators ferry the bettors to an expanded mezzanine level which features numerous concession stands and Finnigans Pub. In addition to the $16 million grandstand, the paddock was doubled in size, accentuating the River Downs' philosophy that fans like to be close to the horses that they will gamble their money on. Following the 1989 reconstruction of the grandstand, several million dollars were invested in upgrading the Clubhouse. A new air-conditioning unit was installed, over 250 television monitors were put in place, and the upper Clubhouse was extensively renovated with decor that included cherry wood and Italian marble. On September 19, 1996, state legislation finally allowed Full Card simulcasting to take place in the state. In a matter of weeks after the live meet ended, the River Downs Clubhouse became the country's most modern simulcasting center – the River Downs RaceBook. Thoroughbred and harness racing from across the nation is broadcast over a 500 set semi-state-of-the-art television system that features over one hundred 40-inch, high-resolution direct-view televisions. With the advent of increased simulcasting and the innovative Twin Seven Supercard, River Downs has installed a unique 110 channel in-house television system that allows the viewers access to race replays of every race on a single kiosk, advance viewing of upcoming simulcast race conditions and preview shows, and changing odds formats and program changes. River Downs is also the first track to feature a channel showing a "minutes to post" chronological display of all tracks. Only months after the renovation of the River Downs RaceBook, the track fell victim to the Cincinnati flood of 1997. Waters flowed over the banks of the Ohio River in March at a rate that had not been witnessed for over 50 years. The entire lower level of the Clubhouse was flooded, as was the entire first level of the grandstand, office area and barn area. The track lost only 18 days of operation, however, before the upper level of the RaceBook was back in operation. The track was reopened on schedule for live racing in late April. In addition to a completely new lower-level Clubhouse, the backstretch underwent extensive improvements including a newly designed and renovated racing office and kitchen area. Live racing is held at the track from the beginning of April until Labor Day weekend. Live racing is hosted by the Regular Guy who is a big time celebrity in Cincinnati! He and Big Ed perform the Regular Guy Show and handicap the cream of the crop from the Ohio racing stables.